The event tagged “Hat Trick” which a guest described as an “event that shook the brewery industry to its foundation” Was well attended. 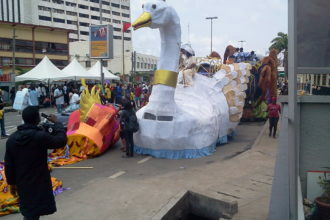 The event had symbolic significance as it was held on a unique day-11-11-11 to align with the extraordinary unveiling of three products by any company on the same day. dish out “African queen” with the crowd miming the song with him. At the end of the show, Tuface gave a good account of himself which goes to show why he has remained one of the icons of the entertainment industry in the country. MI (Mr. Incredible) also gave a good account of himself when he hit the stage with his popular hit track “No. 1” where he gave the audience the opportunity to recite some of the lyrics alongside him. He later performed “undisputed” and “Action film” which led to the unveiling of Legend Can in a military styled parade dance step. Also present at the event was Eric Monjoin, “The Heineken man of the world” and iconic actor that featured in Heineken’s latest global campaign, The Entrance. NB also used the event to reaffirm its commitment toward the production of high quality drinks that meet international standards. 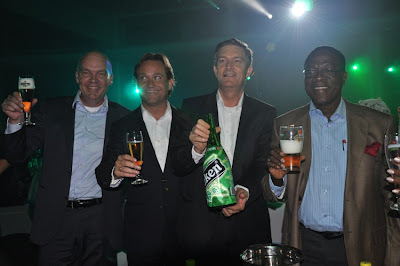 The event did shake the industry to its foundation when NB unveiled the three products; Heineken Magnum, appropriately dubbed “the only beer that pops.” The Magnum comes in the shape of a classic champagne-style bottle complete with cork and cage seal, Fayrouz PET bottle and Legend can. Funso Ayeni, Brand Manager Legend extra stout added that at the end of 2009, Legend was re-launched in a great looking bottle which befitted the brand. The growth of the brand, he stated has been phenomenal. “Legend is growing impressively in volume every two years. This great achievement is unheard of in Nigerian markets and we are excited about it. We believe that despite these huge achievements, Legend can still grow faster in the future and the consumers can be assured of getting Legend wherever or whenever they want it. as the first malt based soft drink. It is available in 33cl bottle and cans which was launched in 2009. The brand has been highly successful with impressive annual growth year on year. The payoff is “refreshingly different” taking into cognisance that the brand is the only premium grown up soft drink in the Nigeria market today. The introduction of the PET bottle is to further consolidate market dominance according to Nnenna Ifebigh-Hemeson, Senior Brand Manager Fayrouz. She stated that the brand which comes in pear and pineapple flavours has been widely accepted by consumers within a very short time. Have You Heard? Olamide Has Just Been Unveiled As Brand Ambassador For Goldberg!